The weather is pretty wild here at present - we are watching our trees - very stormy and lots of rain in big downpours. Good weather for staying indoors. 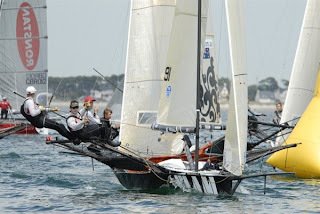 We were waiting to follow Grant in Carnac as they must have GPS on each boat and we could see where he was but the racing was finally cancelled - no wind. 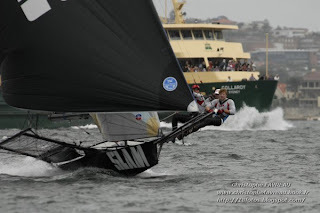 Pleased to say he was out training in the very light winds. Rather spectacular really. 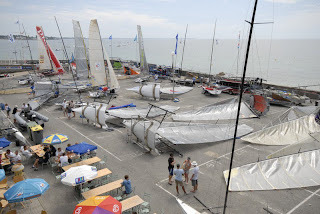 This is what yachties do when races are postponed - this was yesterday's scene at Carnac. Heather - Warandyte is a suburb in Melbourne where Jacinta lives. 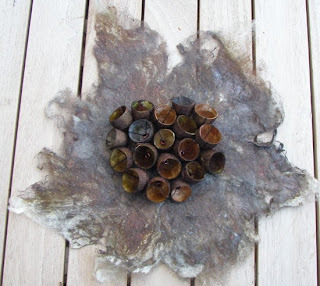 It is one of her original colours she dyed and I love to use it in my rusty stuff. I wanted her to change it to The Claremont Yacht Club Rusty Pylons but lost so I am educating you all in the name for rusty! These are the Warrandyte silk tops - people often forget that rust has wonderful shades of blue in it at times. Lots of parcels arrived today including the latest CPS which will go out tomorrow and finally after waiting for yonks (and paying for it yonks ago) our shipment of Twinkling H20s and Polished Pigments so we now have all in stock. We were down to about 2 packets of the Twinklings and Ian was worrying that they would never turn up. 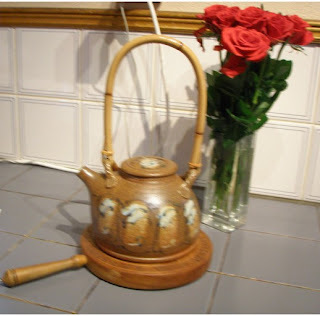 I thought I would make it blog teapot day today sitting by another bunch of my roses - I do love them and since they cost around $7 each time i buy them I reckon that's okay. We are not really tea drinkers - just the occasional herbal tea but I am rather fond of this one. We had a student at one stage who put my beautiful big pottery teapot on the element and while it didn't break up, it cannot hold tea anymore so I got this one instead. I think a blog jug day is coming up soon - what do you think? It is still raining a lot but we did manage to get out for a walk and coffee and I run to the studio inbetween the downpours. It really is lovely. Not a good game for the All Blacks tonight - they really are going to have to lift their game for the Tri Nations. Maybe I will follow the netball -- I think Bay of Plenty might be playing in Perth this weekend? It is so lovely going to bed with rain on the tin roof. And rain bucketing down. The little things that give you pleasure. 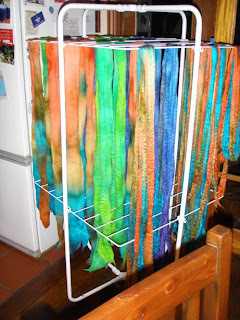 You might imagine that I have taken up dyeing again - most definitely not so. Jacinta knows how desperate I always am for stock so she often sends me overnight bags with wet fibres and I lay them out on the table outside and they drive in a jiffy but not at the moment so here is a lovely collection of Kimberley Dreaming and Lapis Lazuli colouring up our kitchen. And some Lime Fizz as well. 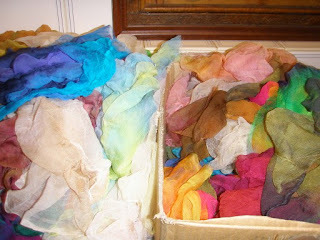 And if that isn't enough colour, here is what I have been doing all afternoon - finally organising the silk tissue which Rae has dyed for me. Now you can see why I would never have time to dye. What a bonus - rain and cool - it actually makes you think you might really be in winter. 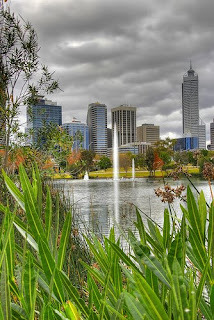 This is Perth from the South Perth foreshore - it's not a big city at all in case you thought it was - tonight we are off to Spaghi since I forgot to go to the butcher and it is in South Perth and we will walk along the foreshore and look across to this sight after dinner. Sarah's new book arrived just before we went to Melbourne so I took half of the order with me and sold them all as I thought I would. Have had to order some more. It has taken a long time to get to Australia - I haven't been able to import it this time - just had to wait but worth a wait and not because she is a mate..... it's on our website. 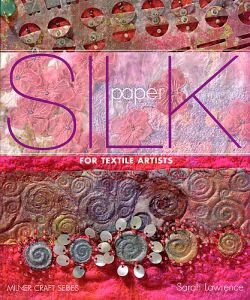 It was high time someone wrote a comprehensive book on silk paper. We also received (I read in the paper today that there is a suggestion that the 'i before e' rule be abandoned in schools) a shipment of our new heavy metallic threads - metallic and rayon wrapped around a papery core - 30 colours - I loved the samples for wrappings and stuff. Just working out how best to package them. I am also very busy working on The Holey Moley Club - the requirements are nearly ready to email out and the draw for the big prize for signing up before 5th June will be on Saturday. I have also loaded new dates for Embellish Stitch Enrich and Ratty Taty Papers - this time I am allowing 2 weeks a lesson. 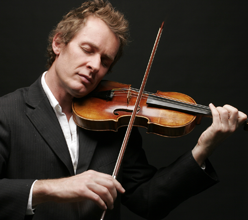 You can read about that on our website. And amazingly - my roll of 70gsm Lutradur arrived as well after a 3 month holiday on the high seas I think. We have reduced the price a little and now have plenty of stock. It's the best weight for journals and goes well with the light and the heavy for layering. Here we are back in Perth - and here I am flat out at the computer answering the emails and preparing to be filling orders today and unpacking. It was lovely to be in Melbourne - we managed to spend the first morning roaming around and then at night catching up with friends and rellies. Paperific is quite a small show and different from the usual hectic scene and it was lovely to see all those customers who we normally don't get much of a chance to catch up with. I took the camera but only took one photo and that was at breakfast before the show even started. 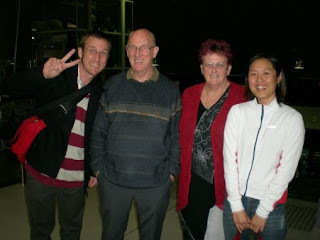 on the other hand - here are all of us at the airport when Kaz and Bruce flew off to Japan. 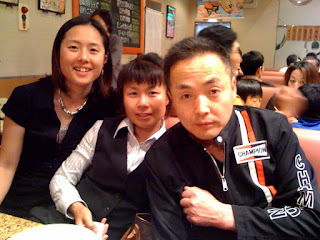 On Saturday night we settled into our apartment and watched the two rugby games. Very pleased and relieved that the ABs won - in atrocious conditions in Wellington. Off to work and unpacking and ordering. I have a few things to chase up today in the way of new goodies - going away gives me time to think and lots of emails to answer. Forgot the camera last night but we had a nice bbq at Grant's - we are the chief custodians so it is a very nice weekender or weekdayer or whatever. 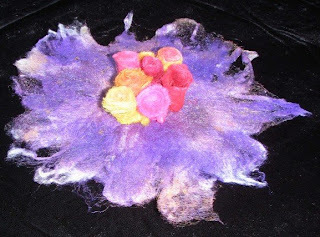 Annette has been creating again - this time with fusible film and Opals - do go and visit her blog for a look see and make sure you read her previous entry as well. Very pertinent. She sent me this picture so I hope she doesn't mind that I have popped it here but I thought it was so wonderful. And Heather - if you left London tonight you would be here in time for the concert. 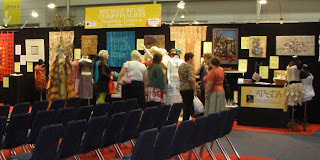 We have just discovered that we will be on our way to Melbourne tomorrow for Paperific when the next ACO concert is on. If you are in Perth and want to go we have 2 tickets for tomorrow night. You just have to collect them from us, go and enjoy a fabulous concert and tell the lady who sits next to Ian that we are away! Having a relaxing day today - it is nice and crisp in the mornings and here and there are trees with leaves changing colour and falling off. You don't take that for granted when you live in a country full of eucalyptus trees. We watched the 2 rugby internationals last night and had a very nice bbq - gosh fish is expensive these days. Ian and I are having the balance of the pink snapper on the bbq tonight. Sad to say the ABs lost and more injuries happening. Today I went to the opening of the Head & Shoulders exhibition which opened at The Old Bakery on 8th Gallery - I loved Linda's bags - fabulous textures and colours Linda's blog you can have a sneak here. Ian has started making his garden shed - he says it is worse than Ikea put together stuff. Slowly slowly - it will be another tick when it is up. I have made a little piece using cocoon pods and Starburst Sprays for Melbourne Paperific. Then I split some lengthwaise and hope to finish a little book to take with me. 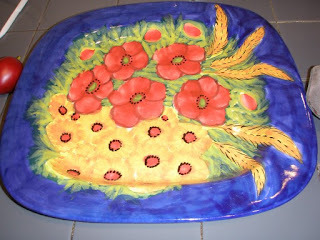 Elizabeth invited me to take part in blog Plate day today - she has some glorious plates posted on her blog. here are some of mine. 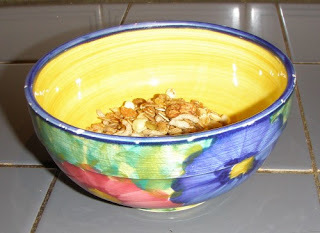 When we travel I like to collect plates and sometimes jugs - maybe we can have a blog jug day? 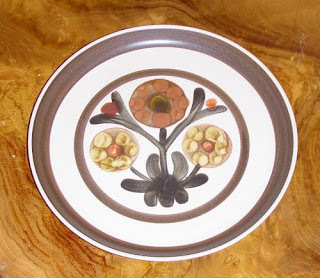 This is one of our Denbyware plates. I started collecting these in 1968 when they first appeared. Whenever a shipment arrived in NZ I would buy a few until I finally had a full dinner set - most are still intact. We had cups and saucers and a coffee pot - all in the very fashionable brown of the day (like most things we owned then including my clothes). Bruce hated these when he was little but now he and Kaz own them. Then we saw Polanski's film Rosemary's Baby and I couldn't believe that my coveted dinner set was used in the film. 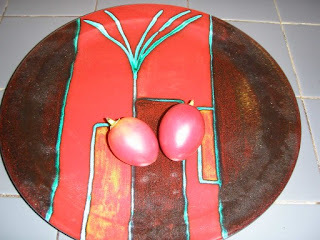 This is the plate I bought in Matakana last year when we went to NZ - Nikau Palm decoration - I have 2 of my favourite fruits sitting on top - tree tomatoes - these days called tamarillos. I indulge myself when they are in season and have 1 with my cereal in the morning. This beautiful plat,e along with an enormous salad bowl, we bought in Tuscany a few years back - they cost as much again to have sent back to OZ but I love them both. This is a bowl (somehow the other one has disappeared) painted by Jenny Dawson in Perth - we have a couple of her mugs as well. Bought some years back. 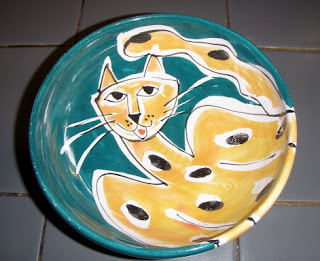 And this last one is my breakfast bowl which I bought in a market in Provence. I have my Ansko Muesli and yoghurt and today a tree tomato in it almost every morning. I received this wonderful book in the post today - all paper - unbelievable and everything is so exquisite. Giving me loads of ideas. 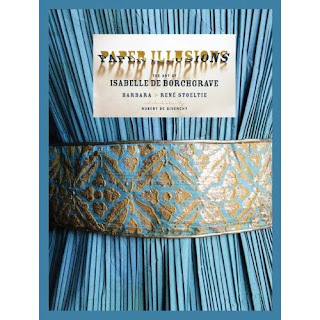 Paper Illusions is its name. And this is one of my playings for Paperific next week. Tomorrow I need to pack the boxes so the palette can go on Friday morning. 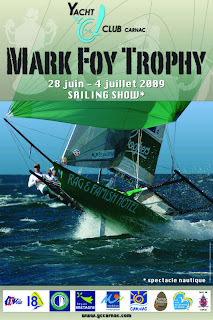 We have had lots of emails from people saying they are coming which will be lovely. 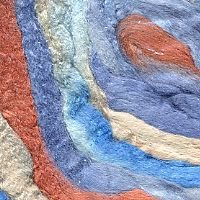 I am not bringing lots of threads by the way - lots of goodies we don't usually take to shows because of space constraints etc - I am also hoping to do plenty of demos throughout the show. 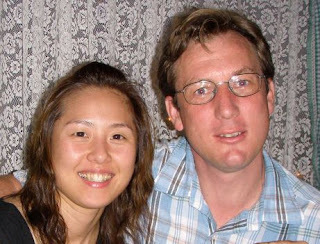 For all those who have asked - Bruce and Kazuko had a one way ticket to Japan and plan to stay for a couple of years. Bruce's Japanese should improve I would suspect. Few exciting parcels arriving this week along with the book which was a bonus for me. thr3fold no 4 has arrived as well. They really are beautifully presented. 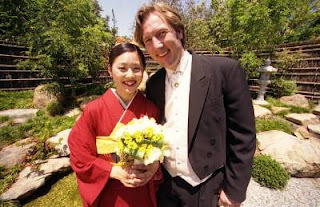 Bruce and Kazuko flew off to Japan last night on their next adventure - naturally we forgot to take our camera with us so will have to wait for them to send us the pics from theirs. They have an 8 hour wait in Tokyo and then off to Sapporo. Here they are last year while we wait! In the meantime - they go off to the northern hemisphere and Grant flies to Singapore tomorrow for a couple of weeks work. While we were away in Brisbane, our iris bush had a heap of flowers - this is the only one out today - it is a lovely little bush which has been here outside the back door since we came here - Barbara used to sleep in it and Bruce reckons she prevented many flowers from growing but i know they come out in sympathy as she died here one morning. 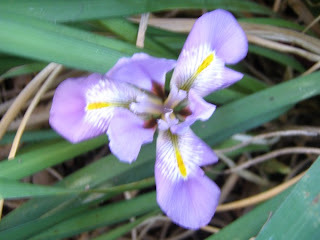 The irises are lovely and I always draw them every year. I don't seem to get any better at it though. Last night we took Bruce and Kazuko out to dinner as they are off to Japan tomorrow - tonight we are having a bbq at their place before we watch the Baa Baas play the Wallabies. I thought I took lots of pics in Brisbane or maybe they were all so bad that Ian deleted them. I surely didn't have time to take any pics on Friday - I couldn't even get in to tidy things up so I took my photos on Sunday - Sunday being Sunday. 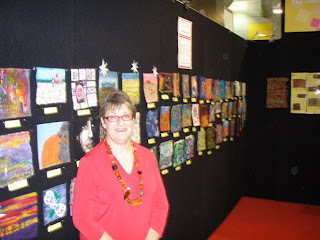 Here is the lovely Lisa posing in front of the Connections exhibition - being the judge I thought we should have her -- I can't see your lipstick though Lisa which was so carefully applied. That is something I always forget at shows - take it with me to put on and never ever do and then months later find the tube in the bottom of my handbag. 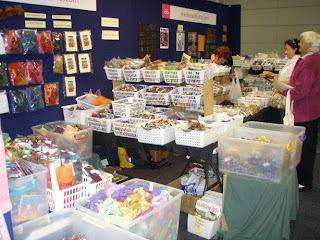 This is the stand on Sunday - had a wee chance to move things around - on Friday there were so many people on the stand I simply couldn't get in to do anything. I had to ask a customer if she would climb under the table and pull out more flimsies and the minute I added them to the basket they were snapped up and sold. 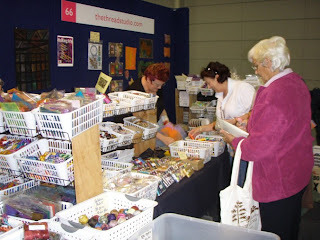 Looking across our piazz to the ATASDA stand - the layout of the show was excellent and you had looking vistas rather than loads of just trading stalls. And we were at the end of row which is how we like it. 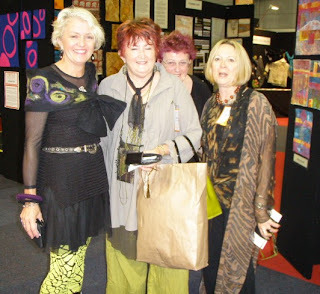 Here I am hiding behind Carol Wilkes and Sharyn Hall - I can see that Carol has been shopping - it was great to catch up with her. Maybe we will take up your offer Carol and come visit and play. As usual when we go away we are pretty busy but we have had some lovely rain especially at night. Last night we went out to celebrate Val's birthday as she gets younger - and by not being here when it really was, it extends it! I wrote the newsletter on the flight home on Monday so it will be ready today and i had time to make a few drawings and notes while we were away so I am off to play with them later today once I have packaged a heap of Angelina. 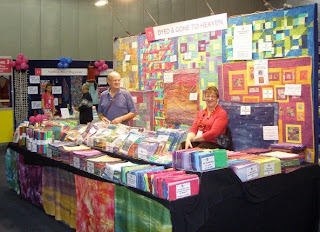 We have just arrived home from Brisbane - what a wonderful show and what wonderful people we met up with. Thank you all so much for your support - made it all worth while. We enjoyed our stay and will post some show pics tomorrow - we hardly had time to do much other than get up and go to the show, tidy up at the end and go back to our apartment but we found this wonderful restaurant - Barolo - where we went almost every night so if you are a foodie in Brisbane we would recommend it to you. Cnr of Mary and Felix - great ambience, great food, nice people. Right now we are unpacking, doing the washing, answering emails and phone calls and starting on orders and then some. 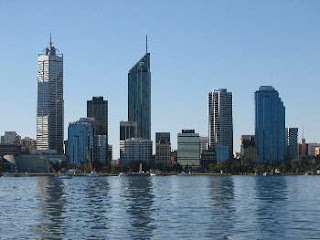 It is a holiday here in Perth for whatever reason but this is usually the weekend we go to Broome so not until next year.